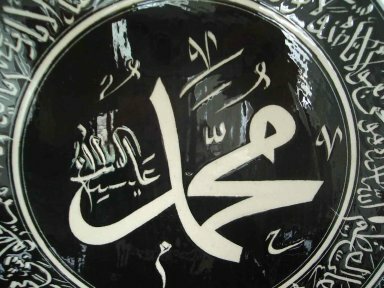 Muhammad is considered by scholars to be the founder of Islam, and by Muslims to be the seal of the prophets sent by God. He lived from 570-632 CE and spent all of his life within the Bedouin culture in the Arabian peninsula. He was born in Mecca, a major city important for trade and as a pilgrimage site. He was orphaned at an early age and was raised by an uncle. At about age 25, he began working as a merchant for a wealthy widow named Khadija, who was about 15 years older than him. After a time, she asked him to marry her. Islamic tradition holds high regard for Khadija and for her husband's devotion to her. She was supportive of is prophetic ministry and, although his culture allowed him to have plural wives, he married only her during her lifetime. When he was about 40 years old, he was in a cave near Mecca praying. He'd become concerned that his hometown was changing and that traditional kinship and family values were fading - that vulnerable people like orphans and widows were falling through the cracks. During one of these prayer sessions, according to the tradition, the angel Gabriel appeared to Muhammad serving as God's mouthpiece, and spoke to him. After speaking, God commanded Muhammad to "recite" back what he'd heard. In Islam, this is called the Night of Power. He left the cave and went home to Khadija greatly disturbed and scared. He went through a period of doubt, wondering if he'd had a hallucination, or maybe a demon or jinn had spoken to him instead of God. But, not long after that, a second, third and fourth episode happened again with God and the angel. These episodes continued for just over 20 years. Muhammad would recite back from memory what he heard from God, and he also recited it again to close associates (including Khadija) afterwards. 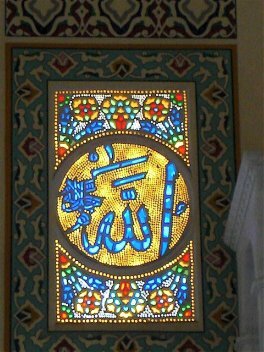 These recitations began being collected in both oral and written from during his life and were combined a few decades after his death into the definitive version of the Quran. Muhammad began to preach and spread the message of the revelations from the one God. He gathered followers from among the Bedouins, who renounced their polytheistic tribal ties. From a sociological perspective, he founded a new tribe of sorts among the Bedouins, and had to do for his "tribe" of people what other tribal leaders in the region did for theirs, namely, secure trade routes for them, protect and defend them militarily if necessary, make alliances for them from among the other tribes, settle disputes among them, and so on. Therefore, he is an interesting figure when compared to other founders of world religions. First of all, he lived longer as a religious leader than many others, such as Jesus or Mahavira. Secondly, because of his long tenure, he was required to wear many different "hats" of leadership for the community: prophet, visionary, warrior, judge, administrator and diplomat, among others. He moved the Muslim community to Medina in 622 CE after tensions arose in Mecca. The way of life was different in Medina - a farming, agricultural community versus the urban, merchant world of Mecca. Muslims struggled there, but eventually Muhammad gained control of the area and the community became established. In 630 CE he returned to Mecca and re-established the community there as well, setting it up as a religious site to God. He died there in 632 CE.